Henry VIII has found his way into popular culture – as a 1933 motion picture ("The Private Life of Henry VIII") starring Charles Laughton, the number one record by Herman's Hermits in 1965 ("I'm Henry VIII, I Am"), and recently as a popular series on cable television-about Henry VIII's reign that they describe as "hallmarked by political and religious upheaval, violence and corruption." 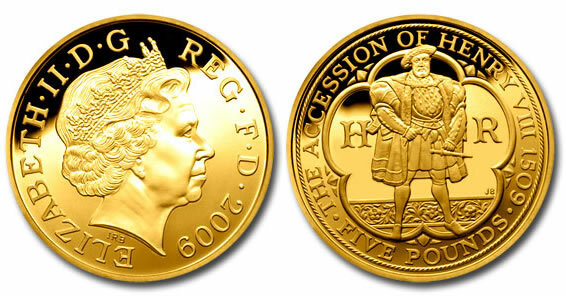 The British mint issued Henry VIII coins during his 38-year reign, and now the Royal Mint has struck coins for Great Britain commemorating the 500th anniversary of his accession to the throne at the age of 17. 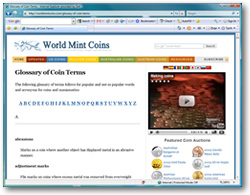 New to World Mint Coins is the addition of a numismatic glossary. The glossary is one of the most detailed available, with coin terms ranging from abrasions, to blank, to clad, to obverse, to planchet, to reverse and to many, many more.